Getting a new roof is a rather large investment, and you want to make sure that it remains effective for as long as possible. 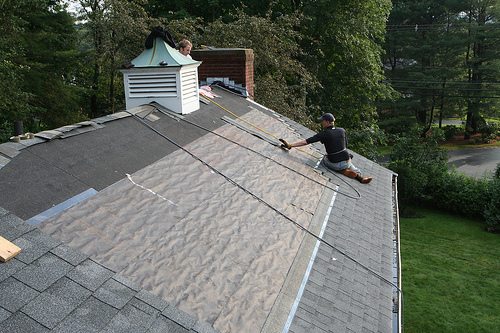 Some people may think that it is unnecessary to spend money on roof maintenance. However, not taking maintaining your roof can actually make the lifespan of the roof decrease dramatically. In the end, time spent on roof care may actually save you money. Keeping up with your roof little by little will be much less expensive than having to purchase a whole new roof. And regular, quarterly inspections are necessary no matter what kind of roof you have. That way you can make sure that any issues can be dealt with quickly to avoid a more expensive replacement. Discoloration is the first sign of roof deterioration. Black streaks or spots mean algae has started to grow. If your roof is in a shady area or faces north, this can develop quickly in the exposed areas. Examine the roof for torn or missing shingles. If you find any, call us to have them replaced immediately before water damage occurs. If the tiles get cracked or curl, they’re easily lifted, ripped or torn off by the wind or a hard Texas storm. To safeguard your roof from accidental trauma, prune or remove any trees that are growing over it. A broken limb can pierce the roof and invite water damage to your interior. If you have a green roof, you need to check it even more often than a shingle or tile roof. Green roofs are great but they require maintenance. Look around your home for water damage. The attic is a good place to start, but interior walls can show signs of leaks as well. If these leaks go untreated, the home structure can be damaged too. The leaks can also cause a mold or algae outbreak. If there’s debris on your roof, it can invite bugs that can burrow into the roof and cause more problems. We can replace any worn shingles quickly to prevent this. Even if you do periodic inspections of your roof, call Texas Star Roofing if you’re in doubt. We don’t charge to come by and evaluate your roof’s condition. We’re experienced, and we can notice things you might not see, when caring for your roof. Texas-sized squirrels and other critters can do plenty of damage to your roof. They usually find a small hole and make it bigger. You might not even notice the damage until the rain starts leaking into your home. If you hear animals scratching around in your attic, you need to have your roof checked to discover where they’re entering, so it can be repaired. Severe Texas storms with hail and high winds can literally rip the shingles off your roof, which exposes it to more serious damage. If you examine your roof and suspect it needs to be repaired, don’t waste time. It can only get worse. Just call Texas Star Roofing for a quick check-up. If we find damage, we’ll give you a free estimate to repair or replace your roof. We understand the extremes a roof in Texas has to withstand, and creating a maintenance system is one of our specialties.